To convert military time yourself, add 12 hours to any time after 12:59 p.m. To convert military time to civilian time, subtract 12 hours from any time that shows more than 12 hours. For example, 1:00 p.m. is 13:00 hours in military time. Midnight is 24:00 hours. 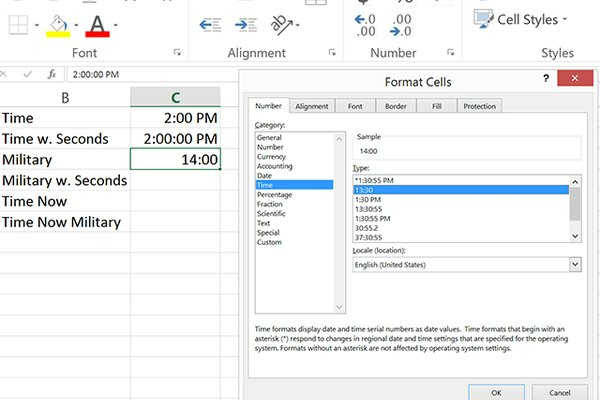 Type any civilian time that is after 12 noon, such as 2:00 PM, in an Excel worksheet cell. Click the Home tab and select Time from the Number menu. 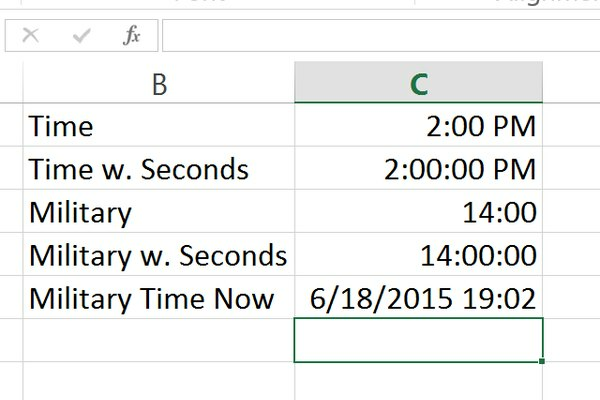 Type the same time in another cell. 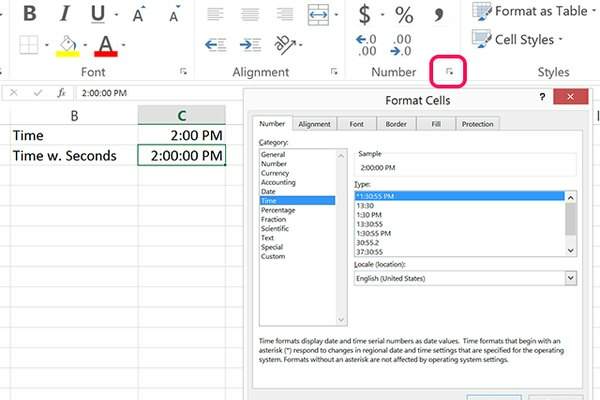 Click the Home tab and this time click the small Arrow at the bottom of the ribbon's Number section to launch the Format Cells window. Click the Time option under the Number tab and and select 1:30:55 PM option. This shows civilian time with hours, minutes and seconds. Enter the same time in a third cell. 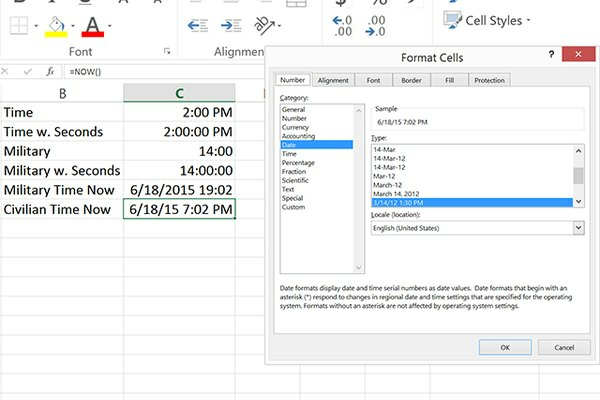 Open the Format Cells window again. From the Time options, click 13:30, which displays military time based on a 24-hour clock. Enter the same time in a fourth cell. This time, select the 13:30:55 option, which displays military time with seconds, not just hours and minutes. 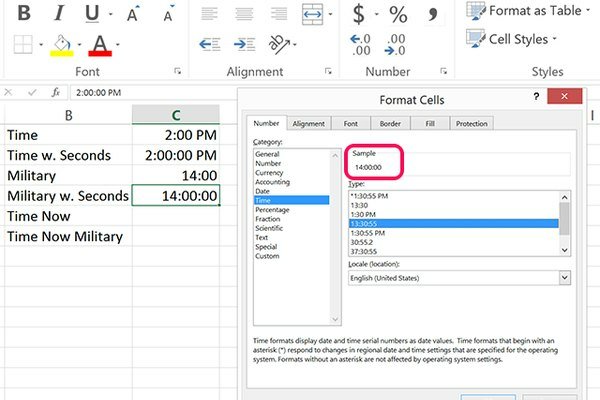 Type =Now() in any blank worksheet cell. 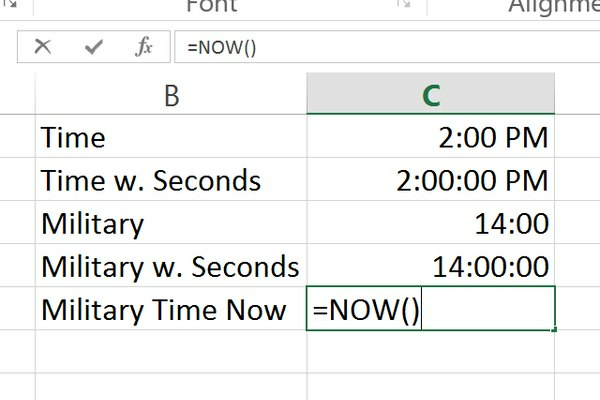 This is Excel's formula for showing the current date and time. Press Enter to accept the formula you just typed. The current date and time is displayed, automatically using a military 24-hour clock. Type the =NOW() in another empty cell and press Enter. Click the Home tab, then the small Arrow in the Number section. Select Date under the Number tab. Scroll to the bottom of the options, select 3/14/12 1:30 PM and then click OK. This converts the military time format to civilian time.